This heating solution is adapted to isolated houses that do not have access to gas mains. 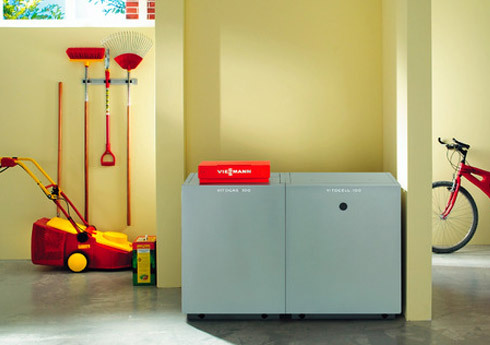 The propane boiler allows you to benefit from the same advantages as mains gas for heating, sanitary hot water and cooking but at a single, isolated location: energy efficiency, efficient and regular production, easy economic maintenance. Like the mains gas-fired boiler, the propane/PLG boiler is a combustion system. The burning gas heats water thanks to a heating element; the heated water is then distributed through the dwelling by pipes running to the radiators or the floor heating fed by a water pump. The condensing system is also used to heat water by recovering the heat of the fumes emitted. This allows you to achieve up to 30% energy savings. The propane/LPG boiler is connected to a gas tank installed in your garden (above or below ground, generally provided free of charge by your exclusive gas supplier). As a Qualigaz-approved gas professional, Clim Var Froid will advise you and ensure the safety of your gas installation. Calling on Clim Var Froid to install your gas boiler will attest to its compliance, to insurers, tenants or possible purchasers of your house. Fast and inexpensive, maintenance of your propane/LPG boiler by a Clim Var Froid expert should be once a year to guarantee your installation’s performance, adjust setting for greater savings, efficiency and less pollution, verify safety points and part wear and tear. If your unit breaks down, Clim Var Froid intervenes quickly to restore optimal comfort to your house.